Hon’ble Australian Consulate-General in Chennai Ms Susan Grace met Minister KT Rama Rao at Camp Office. 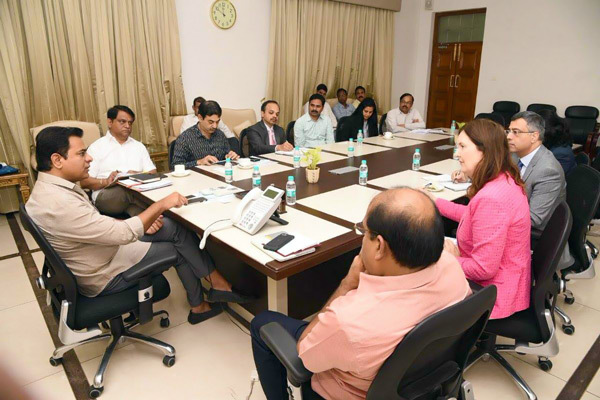 During the meeting, Minister explained about the progressive business environment in the state and outlined the opportunities for Australian companies to invest in Infrastructure, Sports, and IT sectors in Telangana. Hon’ble Consul-General congratulated the Telangana government for launching We-Hub Hyderabad for women entrepreneurs and also for taking up initiatives such as T-Hub Hyderabad to provide a boost to innovation ecosystem. Hon’ble Consul General has invited Minister KT Rama Rao to lead a business delegation to Australia. Mr Munish Sharma, Trade Commissioner & Consul Australia Trade and Investment Commission, Mr Narsing Rao, IAS, Principal Secretary to CM, Prl Secretaries Arvind Kumar & Jayesh Ranjan were also present in the meeting.